In a large heavy pot, heat the oil over medium high heat until hot. Brown the chicken, in batches if necessary, turning occasionally with tongs, about 6 minutes per batch. Transfer the chicken to a plate. Add the onion, pepper and garlic to the pot and cook, stirring occasionally, until golden brown, about 8 minutes. Stir in the chili powder, cumin and oregano and cook, stirring, until fragrant, about 1 minute. Stir in the tomato paste and cook, stirring, until the paste is a few shades darker, about 2 minutes. Stir in the kidney beans with their liquid, the tomatoes and the reserved chicken with any accumulated juices. Simmer the chili until slightly thickened and the chicken is cooked, about 25 minutes. Season the chili with salt and pepper to taste, then transfer to a 3 quart baking dish. Pour the nacho cheese dip in the center of the casserole, then dollop the salsa over the casserole. 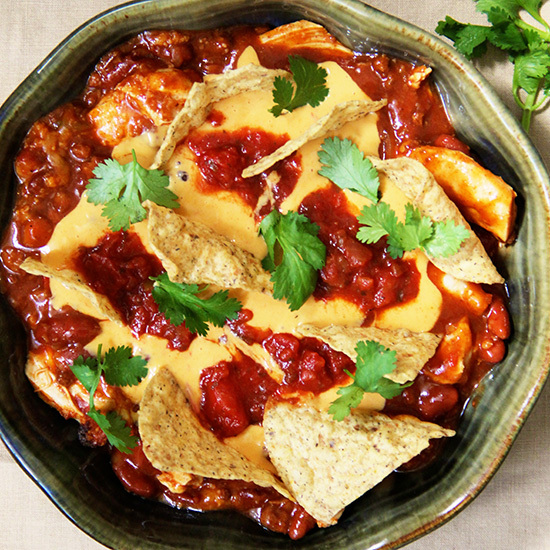 Place tortilla chips, standing upright, in the chili, then bake until the filling is bubbling, about 20 minutes. Serve garnished with cilantro.